While most of the DECEPTICONS viewed MEGATRON's defeat and seemingly extinguished spark as a blow to their cause, STARSCREAM viewed it as an opportunity for his own cause. STARSCREAM has always lived in MEGATRON's shadow, and it burns him constantly. He feels he's done as much if not more than MEGATRON in the name of the DECEPTICON cause, but he simply lacks MEGATRON's charisma to inspire others to follow him. STARSCREAM makes up for this failing with lies, deceit, manipulation and when all else fails - MORE lies, deceit and manipulation. STARSCREAM would love nothing more than to obtain the ALLSPARK himself, win the devotion of the DECEPTICONS and usurp MEGATRON's rule. He?s driven by jealousy, pure and simple. A Machiavellian manipulator who never met an ally he wasn?t willing to stab in the back to get what he wants. Robot Mode Power: STARSCREAM has incredible speed, maneuverability, and hovering capabilities. He can fly rings round the AUTOBOTS. In addition, he can affect a sonic scream and produce powerful blasts of sound that can send enemies spinning through the atmosphere. No one really likes STARSCREAM, not even the other DECEPTICONS. Who can blame them though? He'll do whatever it takes to gain control of the DECEPTICONS, even going as far as trying to destroy his commander MEGATRON. Of cause, he is also nearly as powerful as MEGATRON, and just as sneeky. He is the fastest flier there is, and even OPTIMUS PRIME would have a hard time beating him in a fight. He's the best there is at what he does. Even so he sometimes overrates himself, and that is why he's still second in command. Galatic Powers and Abilities 1) Fastest vehicle mode of any DECEPTICON, 2) Aerial assault and tactical blitz expert, 3) Weapons can shatter metal and disrupt eletronics. 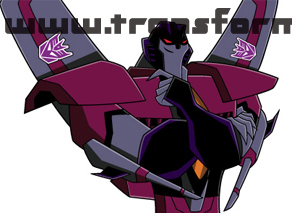 Megatron's scheming second-in-command would like nothing better than to take control of the Decepticons. Starscream's powerful nullray cannons and incredible speed make him a dangerous opponent. Don�t try to deceive a DECEPTICON, AUTOBOT. We are the masters of deception." STARSCREAM has always lived in MEGATRON'S shadows and it burns him constantly. He feels that he has done much more in the name of DECEPTICONS than MEGATRON, but he simply lacks the charisma to inspire others. STARSCREAM makes up for this shortcoming with lies, deceit, manipulation, and when that fails, MORE lies, deceit, and manipulation. STARSCREAM would love nothing more than to obtain the ALLSPARK for himself, win the devotion of fellow DECEPTICONS, and usurp MEGATRON'S rule. He is driven by jealousy, pure and simple. ROBOT MODE POWER: "Nullray Cannons"
STARSCREAM'S main weapons are his arm cannons. He has incredible speed, maneuverability, and hovering capabilities. He flies rings around the AUTOBOTS. In addition, as his name indicates he creates a sonic scream that make powerful sonic blasts of sound that can send enemies spinning through the atmosphere. Fastest vehicle mode of any DECEPTICON. Aerial assault and tactical blitz expert. Sonic shock blasters shatter metal and disrupt electronics.